Not a day goes by that our team isn't helping someone find clarity on what they should expect to budget for a refurbished CT scanner. But we want to make things easier for those of you we haven't talked with yet too, so we're going to break average refurbished CT scanner costs down into tiers: the bread and butter scanners (4-16 slices) through the late models with all the bells and whistles (64 slices and beyond). The "bread and butter" option applies to those looking to perform almost every kind of scan aside from cardiac. The best bet in balancing your clinical and economic needs with capital acquisition and service agreement costs will be a 4, 8, or (we'll get to these in a second) 16-slice CT. If you're buying in the US, be sure you're aware of NEMA standard XR-29 and the effect it will have on your choice. A GE Lightspeed four (“Quad”) slice or 8-slice CT scanner will cost between $50,000-$80,000 installed with a “first scan” warranty. These are solid, workhorse models but, given their age, may be better suited for applications like veterinary medicine or very low-volume use at a small hospital. Our customers have had the best experience with these systems in their H2 gantry/Xtream console configuration. A 16-slice scanner will cost between $75,000-$140,000 installed with a “first scan” warranty. Whether you’re looking for marketability or to meet clinical demands, this is where bread and butter scanners just won’t cut it. If you're looking to do cardiac studies, you'll want a 64-slice machine. 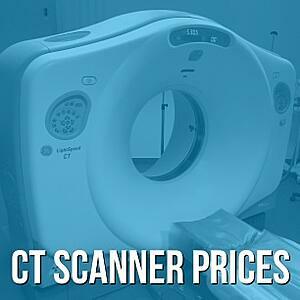 A 64 slice CT ranges between $110,000-$190,000 installed with a “first scan” warranty. The range is fairly broad, but there are a number of features and software options available that can add up quickly. Which of these you may or may not need will depend on the specific circumstances at your facility. The price ranges listed above are ballpark averages that reflect the current market. Your individual purchase price will vary inside that range depending on the manufacturer you choose and which systems are available when you're ready to buy. Use the button below to get a more specific price quote.